What's a nice girl like you doing in a place like Uman? I've just returned from 6 days in Ukraine, on a spiritual pilgrimage with a group of powerful Jewish women. We landed in Kiev and went right to Babi Yar. Today, it's a lovely urban park. The grass and trees hide the brutal acts of murder that were committed against the Jewish population of Kiev. The ravine where Nazis massacred 34,000 Jews over two days in 1941. The memorial to the Jewish martyrs of Babi Yar. We were 10 women who had just landed in Kiev from Israel. We sat together at the base of the memorial and recited Sefer Tehillim for the memory of the tens of thousands of Jewish souls who were murdered in cold blood, machine gunned down into the ravine at Babi Yar. As she recited the tefillah for the conclusion of Sefer Tehillim, the voice of Yehudis Golshevsky, our teacher and guide, cracked with tears. After returning to the airport to pick up the rest of our group who flew in from North America, we drove on to Berdichev to pray at the grave of Rabbi Levi Yitzchak of Berditchev who is known, even in death, as Rabbi Levi Yitzchak ben Sara Sasha. The sign in the tziun of Rabbi Levi Yitzchak reflects his desire to be eternally known as the son of Sara Sasha. Prayer at the grave itself. Entering and leaving the grave site in complete darkness, we passed through a cluster of poor Jews from Berdichev who, speaking no English, cried out to us using the only Hebrew words they knew - "Shalom!" and "Tzedaka!" Dinner was in the Beit Chabad in Berdichev. We were urged to drink only bottled water in Ukraine. During dinner, the Chabad shaliach's 12 year-old daughter entertained us with her violin. Yes Dorothy, there is a kosher mikvah in the Chabad House in Berdichev. 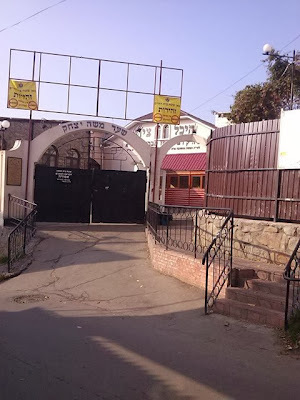 After dinner, we journeyed on to Medzibuz, the town from which the Hasidic movement sprang, driving three hours across the darkness of Ukraine, to spend the night near the tziun of the Ba'al Shem Tov. When we arrived on what can only be described as a Jewish compound, it was brimming with Israeli women. We quickly learned that our expected accommodations were not available. The main building near the tziun where we were supposed to have lodged for the night. A kind of Ukrainian Motel 6 in Medzibuz, part of the compound built to accommodate the hordes of Jews who come to visit the grave of the Ba'al Shem Tov. The house where we actually stayed in Medzibuz. Except for the fact that the bed I was assigned crashed to the floor the exact moment I lay down upon it, the accommodations were decent, with clean and modern bathrooms. This sign outside the house where we slept in Medzibuz was the first indication that the Jewish presence in certain parts of Ukraine is, k'eilu, Israel. When I got to the dining hall, I realized there was Hebrew everywhere. Except in this house that makes Medzibuz feel like Anatevka. A neighbor of the Ba'al Shem Tov's in Medzibuz. The next morning, striking rays in the sky welcome us to Medzibuz. Before breakfast, I head to the tziun to pray. As I walk alone down the path, I hear women singing. It is very loud. I open the door and I see, right away, that it's overheated and packed beyond reason. There must be a hundred women in a room that's about 400 square feet, standing wherever they can, amidst six large kevarim. I'm about to turn away to leave when the arms of a stranger pull me in. And I enter something unworldly. A hundred women are chanting. Twenty four times they sing this verse. Over and over, louder and louder, hands raised to the heavens. At the window, a woman plays her violin, drawing out her chords. Beside me, an old woman puts her hands on the head of a young woman. A bracha that the young woman should find her zivug flows from the old woman's lips. After the 24th repetition, the prayer leader signals the end. Tears spring up in my eyes. I hear weeping all around me, see the precious faces of women I don't know, wet with tears. The collective prayer of these women raises me to transcendence. I am no longer in rural Ukraine. I am somewhere else, somewhere higher. This is the power of women at prayer, when we are free to pray out loud. The lack of this has been a painful deficit for me for a very long time. I have come to Ukraine and I have found it here. Together, they recite Nishmat Kol Chai. And when they leave, the room deflates. Now, despite all the memorial candles burning, it is cold. Our next stop is the reconstructed shul of the Ba'al Shem Tov, where we learn a bit of Hasidic family history, especially how the chief recipient of the Ba'al Shem Tov's teachings was his daughter Udel. And we dance. On the way to Breslov, a tire on our tour bus blows. While we waited for our driver to replace the tire, our resident musician, Tziona Achishena, pulled out her guitar and sang an impromptu song, all about emuna and accepting how the blown tire and the time we sit by the side of the road is exactly what Hashem sent us. I don't know how long we were detained because our time was filled with song, with women expressing our joy, our sadness, our tefillot. We were a couple of dozen Jewish women from all over the world, detained on a Ukrainian roadside, living out loud. By the time we arrive in Breslov, it's already dark. We have missed the chance to see the river running though Breslov and the inspiring forests where Rebbe Nachman practiced hitbodedut, his unique form of private communion with God. We climb about a million poorly-lit stairs to the tziun of Reb Nosson, the chief student of Rebbe Nachman. I am taken by the absolute humility of the kever of Reb Nosson. The only marking is his name, set in what look to be inexpensive press-on letters. Leaving Breslov, it's on to Uman, the focal point of the entire journey. We arrive and I'm anxious to see the tziun, anxious to get to the main show. The women's section is visually unimpressive. I'm told it's much improved from the past, but it's still quite inferior to the interior design of the men's section. I worked hard to not let that impact my openness to Uman. In every respect, the physical room was the least important aspect of the whole Uman experience. It's a long narrowish room with about 100 seats made of pressboard in 3-4 rows. There are dozens of tzedaka boxes, bookshelves and long shtenders filled with Tehillim, sifrei Tikkun HaKlali and other important Breslov seferim. A portion of the kever itself is in the far corner. Our group spent four nights and five days in Uman, walking back and forth between our rooms at the surprisingly comfortable Inn Uman and the tziun, praying, learning Torah, talking, singing, dancing, eating and getting the tiniest bit of sleep. I have never had that much time to devote exclusively to spiritual efforts. No work. No groceries to buy and put away. No cooking, cleaning, laundry. There was nothing but me, my neshama, a group of women, all fully committed to their spiritual development, Rebbe Nachman and Yehudis Golshevsky, a remarkable teacher in whom all good things are found. She taught us Breslov chassidut, made us laugh with references to American pop culture, lained Shir HaShirim, danced, sang every single zemer in the bencher, prescribed a homeopathic treatment for a member of the group, acted out an Eliyahu HaNavi story and cried when she prayed. I'm about as tzioni as they come. So I can't really wrap my brain around the fact that something profound, and deeply holy, happened to me in Uman. In Ukraine. Which, as far as I know, is not the Holy Land. I can't parse out how much of what happened to me in Uman was Rebbe Nachman's doing and how much of it was the combined spiritual power of women and the totality of the experience. In the end, I'm not sure it really matters. It's not Israel. But there is something holy there. If you're a woman longing for a deeper connection with God, I urge you to go on a women's trip to Uman. Try to go with Yehudis Golshevsky. Too bad "Living Out Loud" is already taken. It would be a good title for your book. Thank you for sharing your beautiful experience! It will be interesting for you and those around you to see what you bring back and incorporate into your tzioni Israel-based life. Beautiful. Thanks for sharing. So glad it was a positive experience for you. Wonderful. Wonderful! I am tempted, but not. I look forward to discussing it with you. This was really interesting. ..Thank you! Hey, I'm finally going! And you (and your article) gave me the feeling that I might just want to go Uman one day! Cool! I went with my daughter last year, before her wedding. I look forward to hearing all about your trip.